So yeah...I've sort of lived thirty years without a schedule (god I'm old). Mind you, I buy a gorgeous exciting promising shiny new planner every year, but if I ever get to filling out even a week I end up forgetting to follow it, or get so discouraged about missing something the first day, that I give it up all together. I do keep lists. I'm obsessive about lists, like a lot. I organize my shopping lists by the layout of the market or store I'm going to, if I make a typo I rewrite the entire list...that kind of crazy-ish. But I have found that I rely on lists more than ever. Depression and fibro wreak havoc on my memory, not to mention the insane level of stress dealing with my health causes me every day. Now when I'm at the market I have to check-off every item I buy with a pen because if I don't I will somehow skip over five things. Anyway. I'm going to really start keeping a schedule (really). I found this one on the most gorgeous/addictive/expensive little web-shop for anyone who really likes pencils and stationary (basically, this store is made especially for me). It wasn't cheap, but I love it and the format of it is brilliant. actually write it down, use the damn planner! It’s okay if I don’t get it all/any of it done. It doesn’t mean I failed, wasted a page, ruined my week. Just keep going. I can move important things to the next day, or if they aren’t on a time crunch, forget them all together. Trying is the thing, not being perfect, but trying. 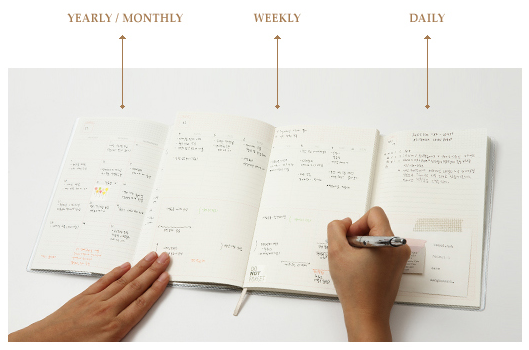 Do you keep a schedule or planner? What about lists? Do you schedule time for yourself and things you enjoy, or just the 'must dos' like bills, appointments? "Trying is the thing, not being perfect, but trying." Damn straight! I WANT/NEED a cute, largeish planner for this coming year, something that I can write out shorthand descriptors of the thing I'm jotting down (or room on the side for that? ), but I also have a large whiteboard calendar that I *TRY* (that operative word, heh) to keep filled out with whatever I have stored in my phone. That way if my phone gets lost or something awful, I have all the info that I need for at least the next month right there. Plus it helps Corey to keep organized when he can see for himself what I've got coming up rather than just hearing it from me. I used to be real crazy about my planner, but when I got a smartphone I switched to that. I use Wunderlist on my phone and computers (work and home) to keep myself on track, and I write a LOT of lists. Sometimes I do really miss my good ole planner. But I don't use it as much now that I'm not in college and haven't been for a while.